Attachment Parenting. Is it the key to a healthy self-esteem? What is it and How does it Effect Self-Esteem? This deep and enduring connection established between a child and his/her parents or primary caregivers is the foundation of his relationship with himself. This pattern begins in utero. Some specialists believe that it begins a few months before conception. If this environment is loving, safe and nurturing on all levels, it is the start of a secure attachment. While developing in the uterus, the baby builds his body in response to his experiences. This is a direct result of the experiences of his mother. Baby is building a body suitable to the conditions of the outside environment he is perceiving through his mother. How important those months are and how important it is how the babys' mother copes with stress. 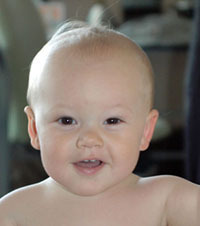 Baby is listening to and responding to his mothers' voice and movements during those months. One of the most important aspects of attachment parenting is the development of the infants' brain. 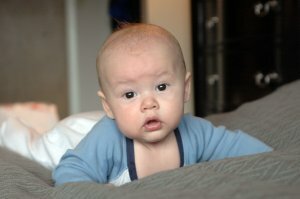 Brain researchers have shown that the most powerful brain enhancers for children is the quality of the parent-infant attachment (such as skin-to-skin contact) and the response of the caregiving environment to the babys' cues. 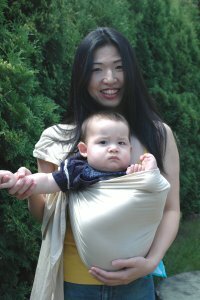 Attachment parenting helps the brain to make the right connections. The old school of regimented schedules and baby training are becoming a thing of the past. I can see now, having studied about self-esteem and the psychology of human development that it should be a thing of the past. Attachment parenting advocates sleeping close to the baby, carrying the baby close (wearing a carrier), feeding when hungry, changing regularly, bathing, playing with, singing to, rocking and being completely aware of his needs. This form of parenting does not allow baby to cry himself to sleep. Now, you may say that it is 'spoiling' him. I don't think so. Attachment studies have spoiled the spoiling theory. Two researchers, Dr.s' Bell and Ainsworth studied two sets of parents and their children. Group A were attachment parents and group B parented in a more structured and less intuitive way. After a year of tracking these families, it was found that Group A were the most independent and secure children. A child must go though a stage of healthy dependence to come out securely independent. (Of course, when a child is older, parents need to understand about setting limits and boundaries.) Another subject, again. When having his bath, just the feeling of having the soap rubbed over is body is enough to bring on laughing. As I explained before, the skin to skin touch is so important to the emotional and physical development of a child. The amygdala, the primitive limbic system, takes in information from the outside and inside of his body in a crude way and creates a response. He needs physical contact, especially with his mother or primary caregiver, to help him regulate his emotions and his body, since this system is so primitive. 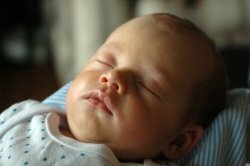 If baby receives this contact in a loving and gentle manner, his brain grows a rich supply of connections into the higher emotional brain centers in the best way possible. He will then be able to regulate himself a little more. Baby is also learning to manage more excitement and be able to mutually interact and play in a pleasurable way. As we know, a healthy mind and emotional state is important to a healthy body and also a healthy body is important to a healthy mind. Self-esteem is a result of all of those factors. As a parent, grandparent or other caregiver, teaching the child that he is in a safe and loving place is paramount. My grandson James is one year old now. In just a few short months he has gone from being a baby crawling across the floor to a little boy who is in a hurry to go everywhere at once. He has been brought up with the attachment-parenting model and seems like a very secure boy. He is very curious about everything and lately it seems to be animals. He saw Eve, the cat, for the first time yesterday. He had been following her around and trying to speak to her but she had eluded him. My husband was carrying James and I saw the opportunity to introduce them so I picked up Eve and brought her to James. His eyes widened and he became silent. He tenderly reached for her. He felt her fur and moved his hand along her body. Then he bent his head down and buried his face in her neck and held it there for a few seconds. That is what I call a ‘moment’. I saw that my husband had a tear in his eye.